Aepo and Elua Reservoir Systems Dam Break Analysis (HI) | WEST Consultants, Inc. Heavy rains of February 2006 and the subsequent failure of Kaloko Dam on the Island of Kauai prompted a major disaster declaration and led to the implementation of detailed dam failure inundation studies for critical reservoirs on the major Hawaiian Islands. 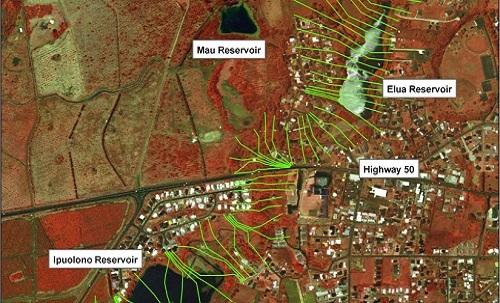 WEST conducted hydrologic and hydraulic analyses to determine the dam breach floodplain below Elua and Aepo reservoirs on the Island of Kauai. The scope of work included site visits, hydrologic modeling, hydraulic modeling, inundation mapping, technical meetings, and reports. The Elua reservoir is located on the southern slope of the island of Kauai, in the town of Kalaheo. It is roughly 13 acres in area, with an impoundment volume of 135 acre-ft at normal pool elevation. Elua Reservoir is impounded by an earthen dam 34 ft in height, with a crest length of about 700 ft. An uncontrolled overflow earthen spillway is located at the east end of the dam crest. The reservoir has an 18-inch low level outlet conduit. Flow from the reservoir drains to the downstream Ipuolono reservoir. The Aepo Reservoir is located within Aepo Gulch, which contains a series of storage and distribution reservoirs that store irrigation water for distribution to downstream agricultural lands. Hydrologic Engineering Center Hydrologic Modeling System (HEC-HMS) models of the Elua Reservoir and Aepo Reservoir watersheds were created based on available geographic and hydrologic data to estimate the 100-year, 24-hour and Probable Maximum Precipitation (PMP) event inflow hydrographs to the Elua and Aepo reservoirs. The HEC-RAS hydraulic model was used to route the Probable Maximum Flood (PMF) inflow hydrograph through the reservoirs, simulate dam breach conditions, and route the flood downstream to the Pacific Ocean. Both “sunny day” and PMP-induced dam breach scenarios were analyzed. Results of the hydraulic analysis were used to define dam breach floodplains and to create dam breach inundation maps.